As we age, I find it becomes easier let go of things that we may not be very good at. For instance, there is no reason for me ever to take another stab at doing my own accounting. I glaze over just thinking about it. And gardening. I always thought I would be a natural at growing my own vegetables, but as it turns out, I’m a lot better at cooking them. It takes a lot of time and attention to grow your own veggies and if you don’t have it, thank goodness for farmers, and the happiest place on earth: the farmers market. Eating locally is very en trend, and it feels like a trend that is here to stay. The less time between the produce’s garden-living time and your plate, the more nutrients they will still contain and the better they will taste. A stroll through the market can also be very culinarily inspiring and often enlightening too. Amongst the expected and anticipated favourites, there are always a couple of surprises. The part of the plant you never knew existed, that, yes, of course you would love to try. Broccoli leaves anyone? They can grow almost as big as collard green, are sweet like broccoli and are perfect for wraps, juicing and sautéing. Zucchini blossoms? We see zucchini year round, but where do all of the blossoms go? Chive flowers? You get the idea. Growing your own food means that you get an abundance of these little treats, but visiting the farmers market is a close second. 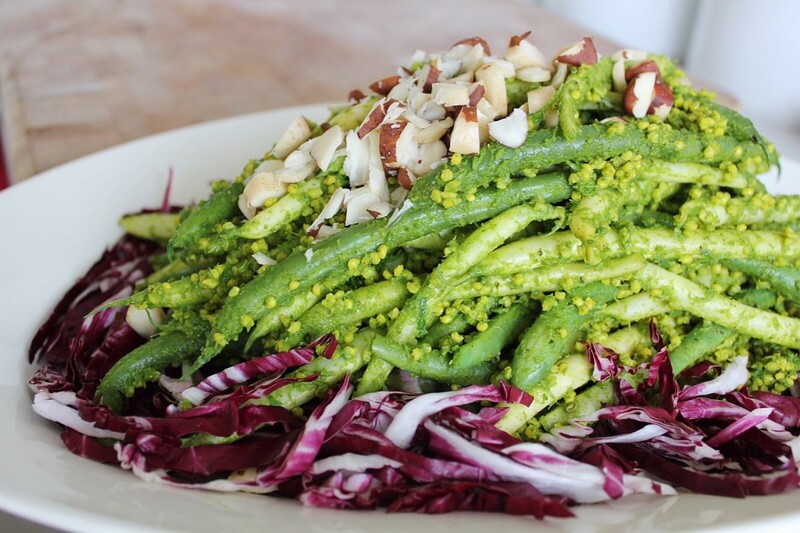 It is the veggie equivalent of nose to tail dining, and I find it really exciting. 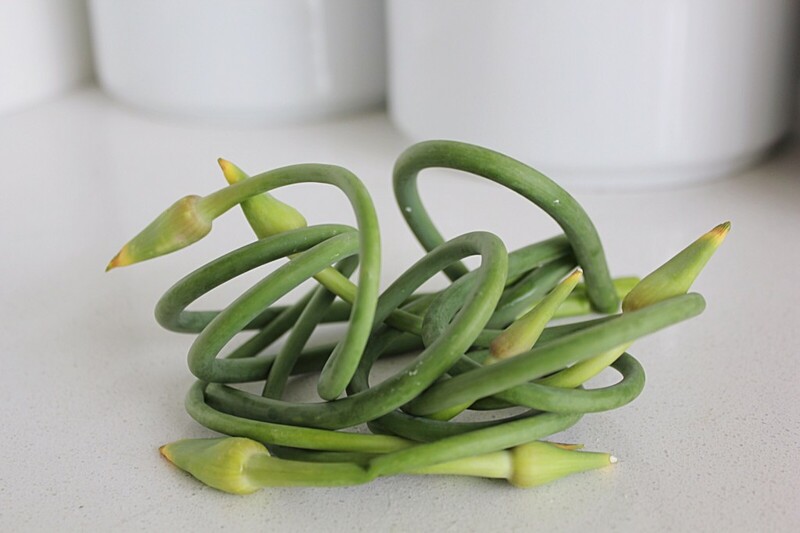 How else would garlic scapes be (almost) commonplace these days? These green shoots grow out the centre of the garlic bulb itself. They taste like garlic (duh) but not in that face-slapping kind of way. They are a little milder, contain chlorophyll and vitamin C, and are a great raw garlic replacement if raw garlic cloves don’t agree with you, or a punchy raw garlic addition if you just can’t get enough. I am going to be using them raw in this recipe, but give them some roasting time in a low oven to take a some of the sting out of them, if a milder garlic flavour appeals to you more. They can replace garlic in any recipe, or add them the way you would add a green vegetable to a stir-fry or soup. 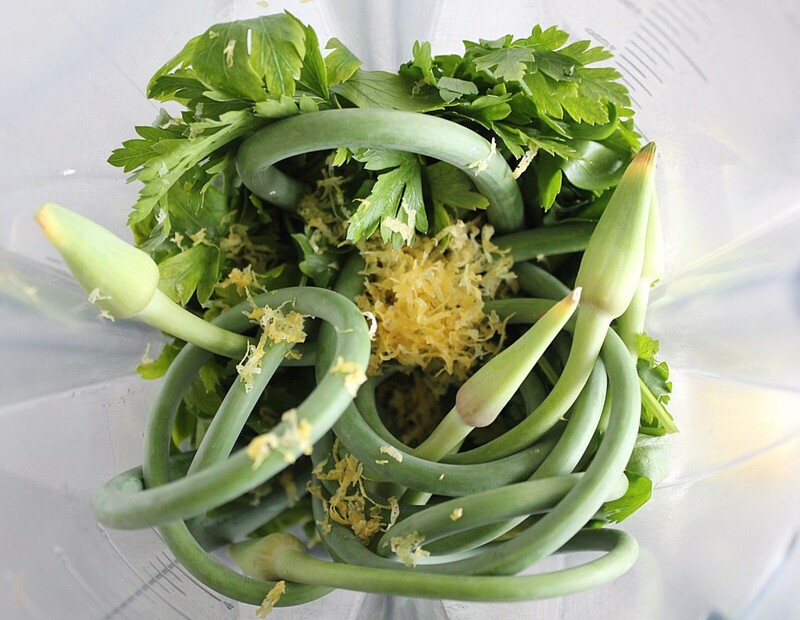 In this recipe, I am pureeing them with some cilantro, parsley, Brazil nuts and lemon juice. 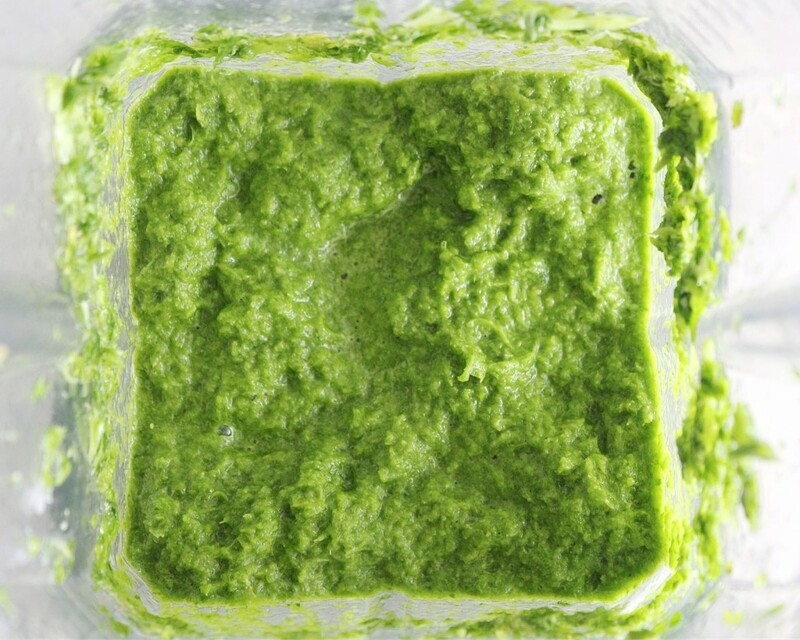 It is a very loose take on pesto, and can easily be used as such – toss with zucchini noodles, stir into some soup, add to a salad dressing, toss with roasted veggies, and the list goes on. Add some nutritional yeast if you want it to have some cheesy swag. 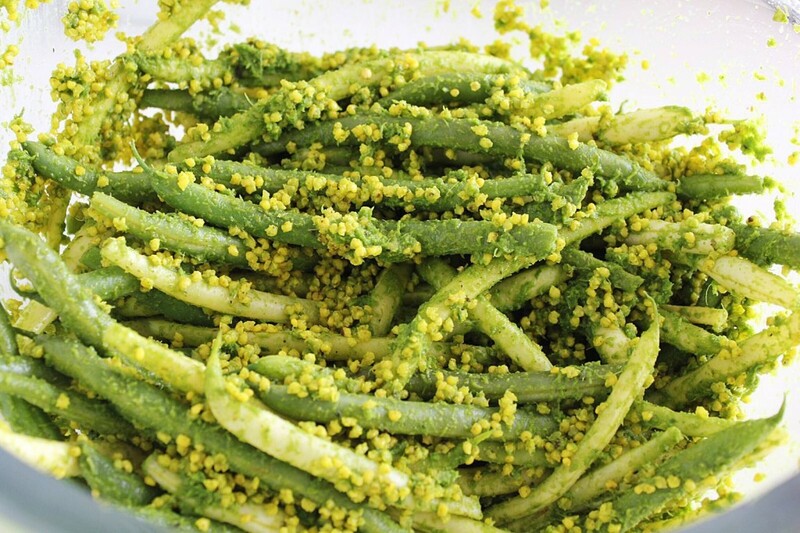 I have added it to freshly steamed green beans with some turmeric-spiced millet. 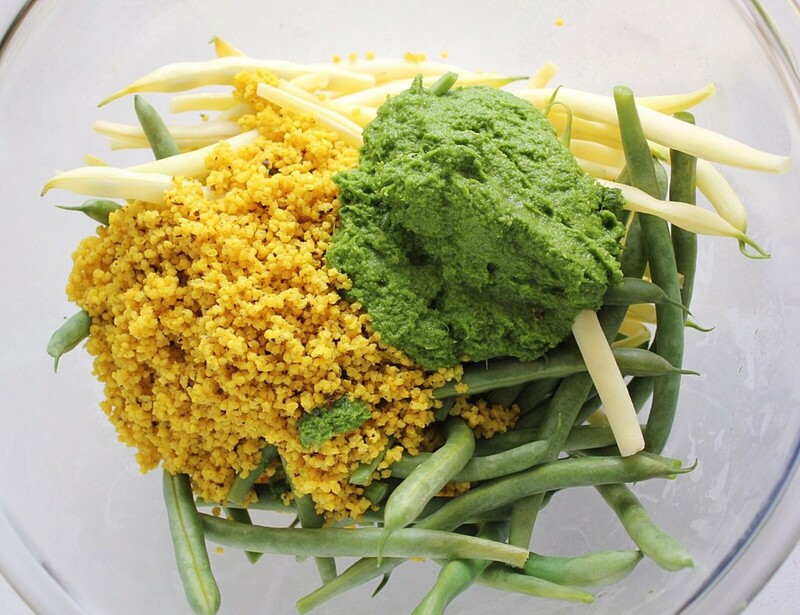 I find that the waxy beans make a wonderful texture vessel for the grassy scape pesto and the millet rounds it out as more of a whole dish. My intent was for it all to be served warm, but as it turned out, leftovers were pretty awesome, so cold works well too. It is all very yellow and green, so I accessorized with some Barney-purple radicchio. The green and purple contrast the way that fake dinosaurs against real dinosaurs would. In case that’s important to you. Radicchio also gives us that bitter liver-love that we all crave, and that extra pigment helps us eat the rainbow. It is also a sturdy, robust ‘green’ that holds up well to hot beans and millet being loaded on top of them. I also like the idea of serving a little bit of raw food with cooked food (keeping in mind that the scape pesto is raw too). In my limited experience, out of all of the vegetables, beans were the easiest to grow. Meaning I actually grew some beans. I think we stood in the garden and ate all seven of them, but if there had been more, I would have made this. Put all of the ingredients together in a blender and blend until smooth. Add a splash of water if it needs some help coming together. 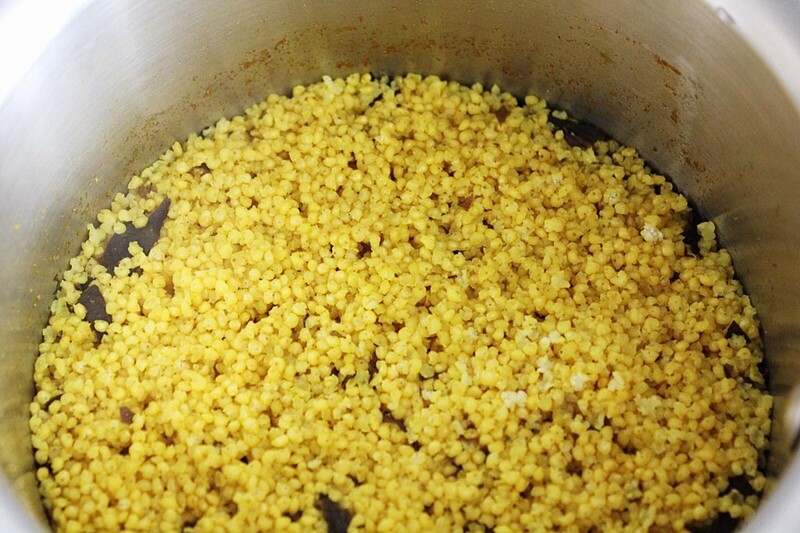 Soak the millet for 8 hours and drain and rinse it. 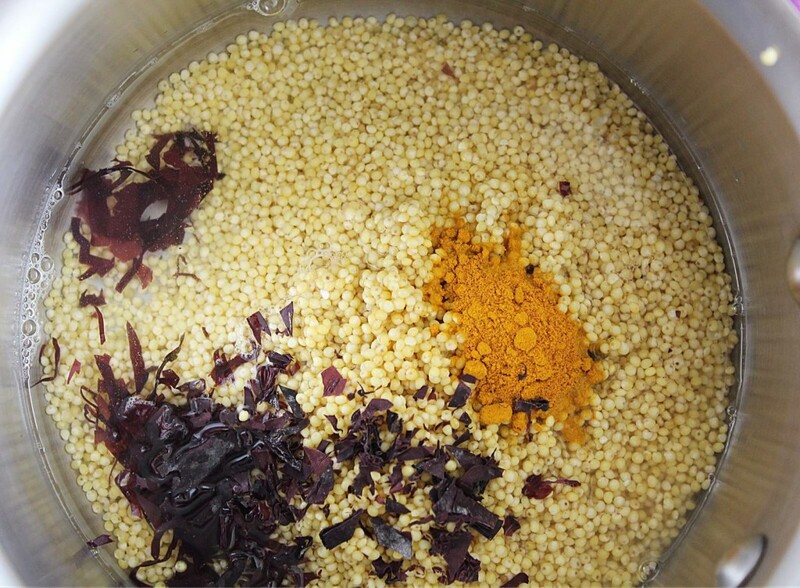 in a small pot, put the millet, and other ingredients together. Bring to a simmer, put a lid on it and turn the heat down. Chop up some hearty greens that can handle a bit of heat (I used radicchio but endive, mustard greens and kale are all good options) and spread them out on a platter. Stack on top of the radicchio on the platter and top with chopped Brazil nuts. Because green sauce doesn’t sound as nice.